The North American Olive Oil Association (NAOOA) recently announced the addition of several major olive oil brands to its Certified Quality Seal Program. With this increase in participation, brands in the NAOOA Quality Seal Program now represent more than one-third of the total tracked retail volume share of olive oil, plus a large share of private label olive oil volume. In 2016 major olive oil brands including Colavita, Filippo Berio, and Goya, as well as retailer brands from Aldi and Wegmans, joined the program, adding to the list of participating brands such as Bertolli, Pompeian, Sprouts, Star and Whole Foods. A complete list of the Quality Seal Program’s participating items is maintained online at http://www.AboutOliveOil.org/qualityseal.html. The NAOOA Quality Seal Program is the only olive oil certification program that collects samples off-the-shelf and tests them for the full range of purity parameters in the global trade standards set forth by the International Olive Council (IOC), a United Nations-chartered organization that has been recognized for more than 50 years as the worldwide quality-standard setting body for the olive oil industry. Brands that participate in the program, both imported and domestic, agree to have their products randomly purchased from stores across the United States and tested to confirm they meet or exceed the IOC standards. Extra virgin olive oils must also pass a sensory analysis by an IOC-recognized panel of 8 – 12 tasters. In addition to the Certified Quality Seal Program, the NAOOA has been monitoring the overall market and testing both member and non-member brands for more than 25 years. In the past three years, the NAOOA tested nearly 500 bottles of olive oil, averaging 167 bottles per year, with the brands collected representing about 40-50% of the total retail olive oil market each year. On average, 5% of the bottles tested didn’t meet the IOC standard, while the market share of the brands not meeting the standard was only 1% combined. 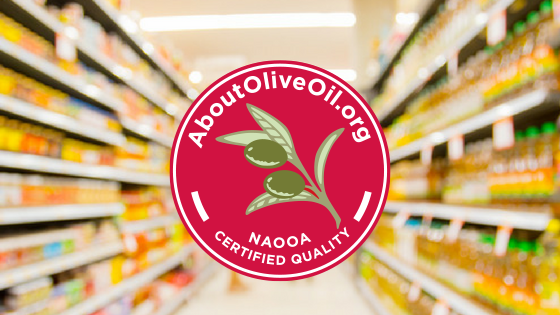 For more details about NAOOA testing and the Quality Seal Program, as well as olive oil recipes, resources and learning materials, visit http://www.AboutOliveOil.org. Established in 1989, the North American Olive Oil Association is a trade association of marketers, packagers and importers of olive oil in the United States, Canada and their respective suppliers abroad. The association strives to foster a better understanding of olive oil and its taste, versatility and health benefits. For more information visit http://www.AboutOliveOil.org and http://www.OliveOilConference.com.